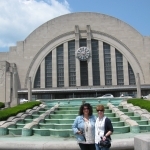 Two Moms and a Car – Cincinnati Day 3- From Baby Cheetahs to DaVinci in one day. Eeeaarrllyy this morning we all loaded up and drove into town to meet Dawn, one of Gail’s friends and the head keeper for the baby animal nursery at the Cincinnati Zoo. Time to play with some furry creatures!! 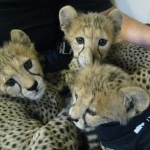 Currently the zoo is taking care of 4 cheetah cubs. We also met two “nanny dogs.” Moose and Blakely act as teachers of sorts for the cubs. They teach them animal behavior cues. Basically, they are teaching the cubs how to play nice with each other. Red, Willow and Catherine are siblings that were born premature. They are super cute, curious, and cuddly! The fourth cub is Donni, who is a few weeks older than the other 3. 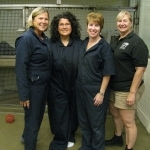 In order to pet the cubs we had to don some VERY fashionable blue coveralls and take off our shoes. To say that the coveralls were a little big would be an understatement. The one Heather had on could have fit all three of us combined! We spent some time petting and being licked by the cubs and Courtney even had Blakely sit down in her lap. Heather , who is not a huge animal lover, did fairly well sitting with the cubs, but really was not a fan of the dogs, but managed to get some great photos. 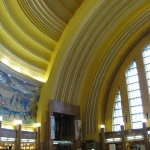 Our next stop was the Cincinnati Museum Center at Union Terminal. Everything about this location screams grandeur from a bygone era. This half dome structure was built in the early 1930s in the Art Deco style. Everything from the flag poles to the signage was created in this theme. We met Cody Hefner who is not only their Media relations director, but a fellow history enthusiast. He gave us all the background on this amazing building. 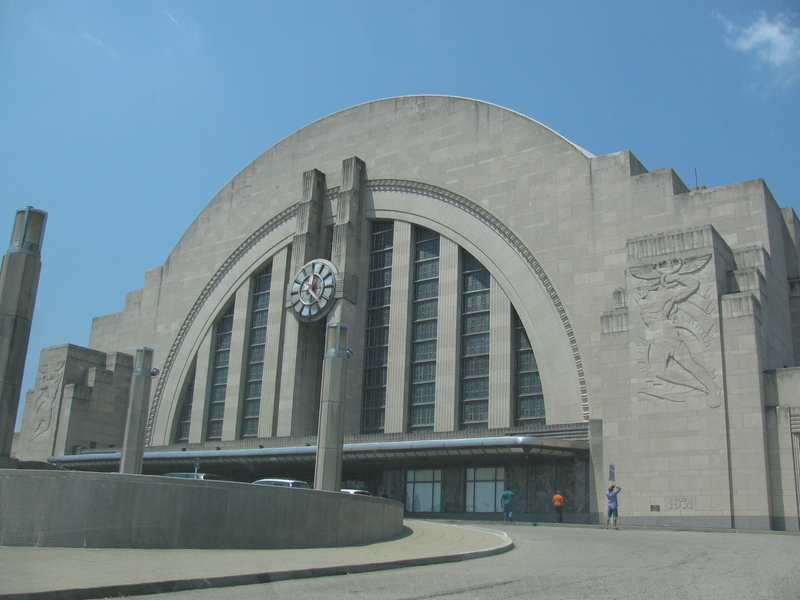 Originally built by 7 railroad barons to serve as a hub for transportation for Cincinnati, it has gone through a couple transformations to arrive at its present use as a museum. Actually, it is several museums in one spot. There is a Science and Natural History museum, Cincinnati History museum, Children’s Museum, Imax theatre, and a hall for traveling exhibits. You could literally spend days exploring this place! Not only are there numerous pieces of art, hands-on exhibits, and artifacts, the building itself is really a giant work of art. 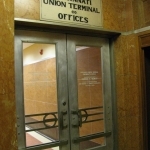 There are two enormous mosaics in the rotunda that depict life in Cincinnati as well as a wonderfully preserved office and boardroom from the time when train travel was king. Cody explained why the building seemed so familiar to us. It was actually the inspiration for the Hall of Justice in the cartoon the “Super Friends.” Meanwhile in the Hall of Justice… J How cool is that? 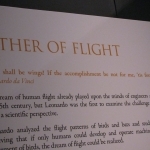 The current traveling exhibit is called DaVinci the Genius. 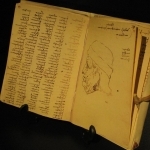 Italian and Australian artisans got together and built a number of inventions from designs in Davinci’s journals or Codices. These 6000 pages of drawings and notes were used to give instructions to artists who created several of DaVinci’s inventions. They used period tools and materials to make wings, weapons, and other labor saving devices. Along with inventions there are several reproductions of his work with the human body, work that laid the foundation for Grey’s Anatomy. 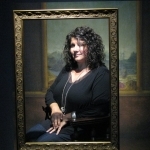 The last part of the exhibit takes an in-depth look at his most famous painting, the Mona Lisa. With the help of some seriously cool tech, researchers have actually been able to prove that the famous lady with the half smile actually did have eyebrows and eyelashes! Visitors can also see a replica of the painting from all sides. 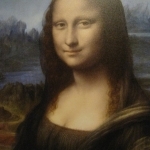 Even if you’ve been to the Louvre to see the original, you haven’t been able to see it unframed and from all sides. This was super cool! 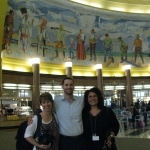 All in all the Museum Center at Union Terminal is one of the most interesting buildings we have ever toured! After a brief rest at Gail’s house, Heather and I drove to Mason, Ohio. 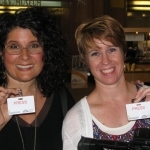 Gail was hanging out with friends tonight so we were fending for ourselves. The Wildflower Café is the perfect place to unwind and enjoy a fabulous meal. This converted two story house is full of cookbooks and has a relaxed atmosphere. One thing we noticed was the lack of salt on the table. Of course, excellent food should not need to be seasoned, so we were hopeful about the entrees we ordered and they did not disappoint. Heather’s steak and my fish were so full of flavor, texture, and perfect seasoning that neither of us wanted the experience to end. And the chocolate chip bread pudding with brown sugar bourbon crème anglaise….wow. Tomorrow we are heading back to OTR (Over the Rhine) to get a glimpse of the Findlay Market on a weekend. Enjoying the journey in Cincy! 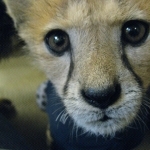 By Courtney Godsey|Filming, Food|Comments Off on Cincinnati Day 3- From Baby Cheetahs to DaVinci in one day.